We are currently seeking dedicated teams of 4-5 individuals to volunteer with Calvary’s job placement program – Step Up DC (SUDC). These volunteers will empower women seeking employment to build stronger futures for themselves. 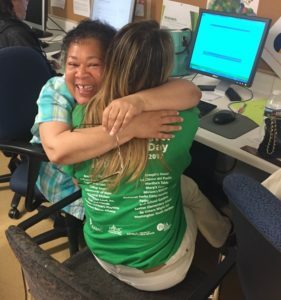 SUDC connects eligible candidates in Calvary’s transitional and permanent supportive housing programs to employers in the community, and is a critical part of a woman at Calvary’s journey towards financial independence and permanent housing. Monday through Thursday each week, women in SUDC participate in job-searching sessions at our facility and at Skyland Workforce Center. We’re seeking groups of 4-5 colleagues to cover one of the workshop days (Mon-Thurs), and volunteer with the program from 9am – 12pm each week. You and your colleagues will divvy up the weeks so one colleague will be responsible for one volunteer shift per month. For example, a group of colleagues from ABC Bank agree to cover every Monday SUDC session. Colleague A typically covers the first Monday each month, Colleague B covers the second Monday, and so on. By signing on to cover one of the workshop days as a group, you’ll be able to switch days with your colleagues if a scheduling conflict arises, and Calvary can still count on having consistent volunteer coverage. This is a great opportunity for volunteers with busy work schedules who still want to make a difference for women in their community. During your time volunteering with SUDC, you will work one-on-one with job-seeking women, encouraging them and answering any questions they have have about job searching, technology, interviewing, etc. Some days you may be asked to work on light administrative tasks that can be done in addition to working directly with women.